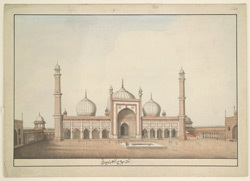 Drawing of the Jami Masjid in Delhi. Inscribed on the front in Persian characters: 'Naqshah i masjid i jami' i dar al-khilafah Shahjahanabad' (Picture of the cathedral mosque in the seat of the caliphate Shahjahanabad); on the back '3. The Jama Musjid, or Mosque at Delhi.' 1817 water-mark. The Jami Masjid was built by the Mughal emperor Shah Jahan (r.1628-58) as part of Shahjahanabad, the seventh city of Delhi, founded by him in 1639. It was the city’s principal mosque for Friday prayers and at the time of construction was the largest mosque in India. Situated on an outcrop of rock in a commanding position, the mosque is laid out as a vast arcaded courtyard set on a plinth and reached by flights of steps, with the sanctuary or prayer hall situated at the western end. The hall has a main façade consisting of five arches on either side of a massive central iwan. It is roofed with three bulbous domes and two tall minarets set at either end of the building. Faced in red sandstone, its surfaces are further ornamented with black and white marble inlays including vertical white stripes inlaid on the minarets and vertical black stripes inlaid on the white domes. This drawing is a copy of the aquatint by T. and W. Daniell, 'Oriental Scenery,' series 1, no.23, 'The Jummah Musjeed, Delhi' (1797). The grouping of the figures has however been changed.